POPL in San Francisco was brilliant. My thanks to everyone who made it happen, particularly the authors and speakers. This year we tried an experiment, with three talks in an hour session (rather than three talks in an hour and a half, or four talks in two hours). I was delighted that all of the speakers worked hard to give a proper twenty minute talk, rather than cramming a thirty minute talk into twenty by speaking fast. Conor McBride deserves special mention for a superb performance of his pearl, 'Clowns to the left of me, jokers to the right'. The comments I received on twenty minute talks and on pearls were positive, and I hope both will become POPL traditions. One of the joys of the trip was sitting in the sun at Union Square, working on the blame calculus with Jacob Matthews, Amal Ahmed, and Robby Findler. 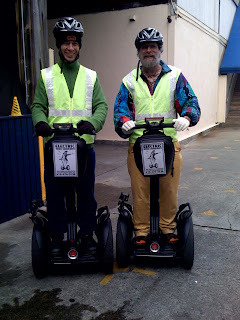 Another was going on a Segway tour of Fisherman's Wharf with Robby. 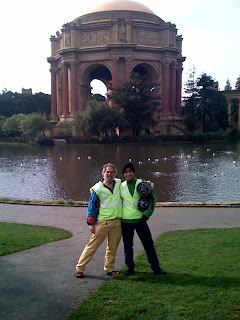 The photos show us on our Segways and in front of the Palace of Fine Arts. x + (y + z) = (x + y) + z. My taste puts S-expressions far above XML, but given the relative popularity of the two, I presume for some it is the exact opposite. but this so painful as to be worse than useless. There must be a psychological theory that can underpin such choices. A quick web search failed to turn up anything apposite, suggestions for the correct terms to search on would be welcome.